The Laboratories is a room inside of the Haunted Towers in Luigi's Mansion: Dark Moon. The Laboratories can be accessed by taking the door to the right of the Skybridge. The Laboratories was presumably an area of research, but has since then been abandoned. There are large broken test tubes and glass containers and plants have broken the flooring on the third floor. There are several Bulbs that are growing on the walls, which can be used to travel around the dilapidated area. On the ceiling are thorny vines that pop these balloons, however. Several chairs and armchairs, presumably from the area that used to be the Lounge above, litter the area. 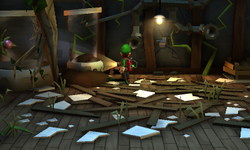 On the bottom floor of the Laboratories, Luigi can peer into a hole to see the Botany Lab while the hole on the second floor gives him a glimpse of the Seedling Laboratory. The door on the first floor of the Laboratories leads back to the Skybridge while the door on the top takes Luigi to the Water Supply. During A Job for a Plumber, Luigi needs to go to the Laboratories to get to the Water Supply at the top floor. When Luigi enters the Laboratories, he is ambushed by three Slammers and three Greenies. During The Pinwheel Gate, the Bulbs do not spawn, but do spawn in Graveyard Shift and Pool Party. During Hostile Intrusion, The Laboratories might be one of the rooms infested with ghosts. Starting from A Job for a Plumber and most missions after, Luigi can use one of the Bulbs and utilize it to get into the large container with the emerald inside of it. This page was last edited on September 12, 2017, at 20:14.